We have spring here and spring cleaning comes. Most of us place the winter clothes at the bottom of the wardrobe, wash the windows in the apartment and prepare the garden for the spring. Someone should take care of our mother Earth. Help the nature in the Moravský Kras to breathe again and let’s clean up the garbage around Ochoz, Velká Klajdovka and Kaprálův mlýn. The event, which is purely voluntary, will be held from 8:30 am to 1:00 pm and will be associated with sitting by the fire after the event in the Kaprálův mlýn environmental education center. Refreshments will be provided for the participants of the event. Also there should be a tour in the Ochoz Cave in May for those ones who helped. You can register by March 30, 2019. Depending on the number of people interested, we will order gloves and bags and of course refreshments. Take a reflective vest (can be found in the car), as we will move around the road. You will also need two public transport tickets (unless you come by car). Meeting point of participants will be at 8:30 am at the bus stop “Stará osada” at the stop of bus No. 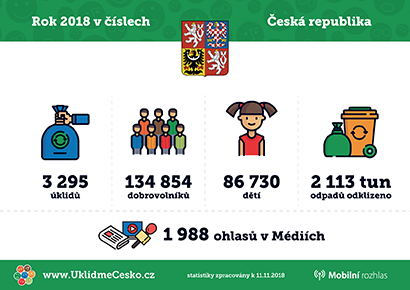 201 direction “Ochoz u Brna, Říčky, rozc.”. Or you can ride directly at place – bus stop“Ochoz u Brna, Říčky, rozc.”, there will be several parking spaces available. If you have any questions, do not hesitate to contact Radka Nováková, event coordinator (novakova.r(a)jmk.cz).